If you find yourself reading the name “James Clay” and asking yourself, “James who?”, I suppose you can be forgiven. The name of this week’s feature artist was, unfortunately, hardly a household word even when he was alive. However, as I have stated before on more than one occasion, familiarity (or lack thereof) is not a reliable indicator of talent! I initially wanted to write about Clay two years ago, but found the paucity of information about him online at the time so disheartening that I shelved the project, until now. Twenty-some years after his death, he is so obscure that allmusic.com can’t get his bio right, confusing him with a 22 year old whose musical genre they never quite get around to defining. There is a very nice bio of Clay on the allaboutjazz.com web site (link below*). I also found a lot of information about Clay on the web site of the Texas State Historical Association (link below**). Texas apparently is proud of their native son, despite his obscurity. I am indebted to the above sources for most (but not all) of the information you are about to read. James Earl Clay was born on September 8, 1935 in Dallas, Texas, which is where he died on January 12, 1995. He died scarcely three years after recording the album I want to tell you about this week, his final recording. But first a little more about him. When Clay was in high school he began to study the flute. He then changed to tenor sax and the rest, as they say, might have been history-making, save for a career-killing decision made at an inopportune time. Clay appeared with a number of jazzmen whose future reputations would outshine his own, including Ornette Coleman, David “Fathead” Newman, Wynton Kelly, Victor Feldman, Gene Harris, and Ray Charles. His undeniable skills with the sax and his experiences with other musicians who were also on the verge of greatness (or already there), were the perfect combination to prepare him for the launch of a memorable career. Unfortunately for his career (and jazz lovers everywhere), he chose to move back to Texas and for most of the rest of his life remained a regional player with a huge talent that far outstripped the limited reputation that resulted from his self-imposed exile. We can only guess what heights he would have reached had he stayed in L.A.
“Cookin’ At The Continental” consists of nine tracks, and opens with the title track, one of two Horace Silver songs we are treated to. Living up to its name, this one “cooks” right from the opening notes. This is a wonderful song, and the guys do a bang-up job on it. Between Clay and Newman, the warmth of their tenors is irresistible. “Cookin'” is followed by the other Horace Silver song, “Sister Sadie.” This song has long been a favorite of mine, and this version by Clay and Co. is as good as any I’ve heard, if not better. There are some great licks on this tune, and when your rhythm section is the current “A-Team” of jazz, you can’t go wrong. Jumping ahead we find the Benny Harris classic, “Crazeology.” I personally don’t know the provenance of the title, but the song is anything but crazy. At a little over four minutes in length, it is the shortest song on the album, and possibly the quietest. Bassist McBride and Clay carry on a nice conversation of sorts with their instruments beginning about two minutes in and carrying on to the end. One of the greatest jazz songs of all time is next, “Easy Living,” which was written by Ralph Raingers and Leo Robin for the 1937 film comedy starring Ray Milland and Jean Arthur. Over the years this song has been covered by many performers, with various degrees of success. I personally love the quiet melancholy with which the group imbues this song. The last song I have time to tell you about is “Barbados,” written by Charlie Parker and Amedeo Tommasi. This is a great song which the rhythm section gives a touch of latin at first. Lightsey and Harper are both standouts on this one. 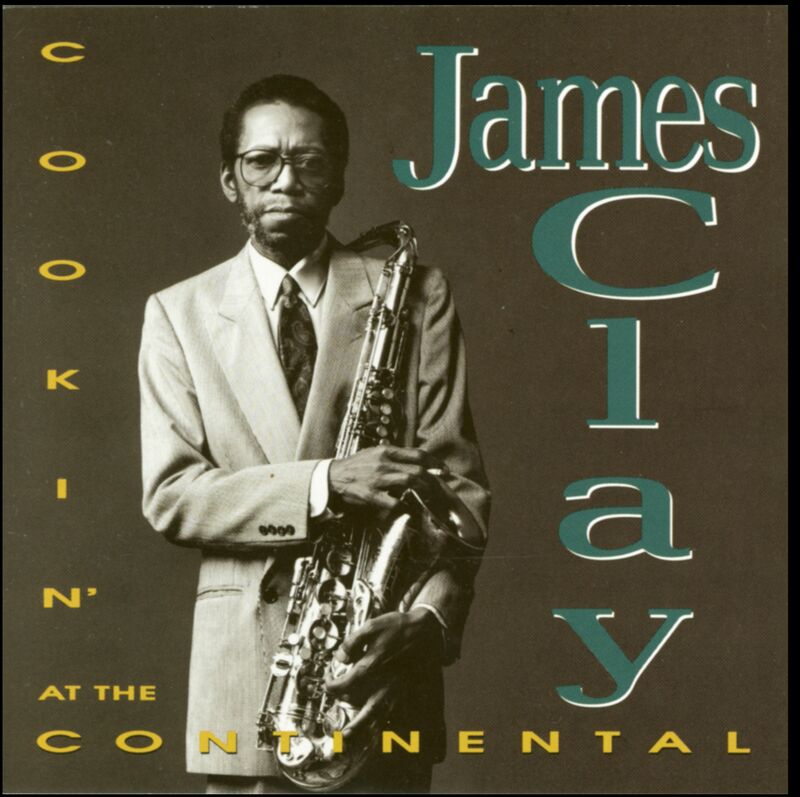 Once again, I am sure it will come as no surprise to you when I tell you that James Clay’s album “Cookin’ At The Continental” will make an outstanding addition to your personal playlist, for a Saturday or any other night! ** Bradley Shreve, “CLAY, JAMES EARL,” Handbook of Texas Online (http://www.tshaonline.org/handbook/online/articles/fcl55), accessed April 10, 2015. Uploaded on June 12, 2010. Modified on August 30, 2013. Published by the Texas State Historical Association. My original content, including photos other than album covers, Copyright © 2015 by Al Evans. All rights reserved. <style=”text-align: center;”>Jazz Society of Oregon today!